Wow, who knew that so many of my friends were experts on weddings? Even those that haven’t tied the knot. The pressure I felt in the days leading up to my wedding were huge. Until the moment I had a melt down on my lovely then hubby to be. We sat down and had a frank discussion about all the things that could go wrong! What if I didn’t get to talk to everybody? What if I spent too long talking to some and not others, what if it rained?! What if someone didn’t turn up?, worse still what if someone turned up that I had forgot I had invited and there wasn’t a place for them?, what if the printers missed someone off the table plan?, I even got to what if we ran out of change at the bar!!!!! Before we both fell about on the floor and laughed until our belly’s hurt. What was I thinking? Who knows! The outcome of that little melt down resulted in the next best days of my life. Excitement took over the fear. What was there to be scared of? Here I am about to marry my best forever friend. The person who I love spending most of my time with, the person who I love to laugh with, the person who cheers me up if I’m sad, the one person who I can be my absolute true self in front of. Who cares if I haven’t lost the weight I had intended too, or my hair didn’t grow as long as I wanted? Not me, not anymore. The big day finally arrived after a long sleepless night on my old bunk bed, in my old bedroom, at my parents’ house, with my two best friends. (Let’s face it we were never going to get any sleep) and our beautiful 2 year old daughter #Didn’tThinkThatOneThrough lol. We had a huge cooked breakfast with pink champagne followed by a chaotic round of baths and showers (again, we didn’t think that one through either) nonetheless it was lots of fun, especially the part were my mum kept turning the cold tap on in the kitchen in an attempt to make my dad, the last to get in, hurry up. The makeup artist arrived and my gorgeous sister was there to do my hair. I know everyone says it but I didn’t really believe it until I looked in the mirror. You actually, really, truly do feel just like a princess. The whole process is all about you. For the first time in your life all the attention and kindness is just solely for you. It’s an amazing feeling and one that I will treasure forever. Finally, it’s time for the cars to arrive to take us to the church. I am so looking forward to seeing my fiancés face as I walk down the aisle. As I walk into the church everyone turns to look at me. The very first thought that came into my mind was “oh for goodness sake he hasn’t combed our son’s hair and it’s all sticking up” (Ha ha, don’t sweat the small stuff!). Smiling to myself and walking down the aisle with my dad was great and the ceremony was by far the best part of the whole day for me. As soon as we had said our vows and exchanged rings, I instantly felt complete. Interestingly I never felt incomplete before! We are one of those couples who did everything backwards. Got together, bought a house, had kids then decided out of the blue to get married 12 years into our relationship. I felt like our circle of life was absolute, joined and free flowing, ready and waiting for our new chapter to move fluidly round it. Sitting together in the back of our wedding car on our way to our marquee reception was a really wonderful moment. We were both buzzing and truly happy. We were excited for what we had just done but still looking forward to the next bit. Because our wedding was in a marquee we were able to have it our way. We chose every single detail and we knew that the food we were about to eat was going to be absolutely stunning. We were so excited about dinner we were not at all ready for what greeted us before. As we arrived to the marquee our guests met us with whoops, cheers and applause. Everyone was completely blown away by the venue. We had a marquee that we had tailored exactly as we wanted it. I wanted my wedding to be special and unique to us. We both love to party as did our guests. 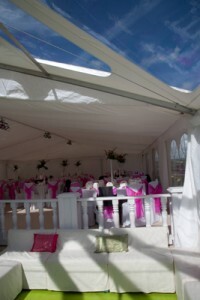 We zoned the marquee into three areas, the entrance / reception bar area; this had the wow factor as it was very simple but very brightly coloured with lime green carpet, sofas, bar, and a peaked clear roof to look up and see the bright blue sky. To the left and the right of this area were plain white screens. Behind one screen there were two steps up to a very simple pure white dining area, white carpet, white chairs, white tables, white vases, the only colour in the dining area were the bright pink flowers on the tables, and the thin lime green ribbon on the place settings. Behind the other screen was the dance area with a black starlit ceiling and walls, bright pink carpet and a dance floor. I had never imaged the guests to be so excited about it. They had simply never seen anything like it before and just couldn’t stop talking about it and taking photos. It was a brilliant feeling. Finally it was dinner time and we all sat down to eat. The food was amazing and everyone commented on it. Looking round the marquee seeing everyone so happy and excited was a really joyful moment. It was such a great feeling to think that we were not only in the middle of the best day of our lives but that we were actually treating our friends to a fantastic day too. Although I had specifically asked for no speeches due to the fact that I love to dance, hate being centre of attention and speeches at weddings always bore me senseless. My dad decided to stand up and say a few words anyway, which was actually really nice and made me feel even more special and loved if that was possible. Then my rather tipsy bridesmaid decided to stand up and say a few (hundred) words too, which was hilarious and had everyone in stitches. By this point my husband decided in for a penny in for a pound and joined in with a few very special, heart felt words of his own. It was brilliant, all totally off the cuff, no-one had stressed about preparing speeches etc. it just flowed. I think it was at this point I realised I quite like being the centre of attention after all. Another special part of my day was the walk home. The most amazing day of my life was drawing to a close, it was 5am the sun was coming up. There was around 25 of us left and we realised it was time to go home; there I was walking through the village where I have lived all my life with by husband and closest friends, in my wedding dress watching the sunrise. It was without a doubt the perfect end to a perfect day. And without a doubt the best day of my life for all of the reasons above. To me this is what it feels like to get married. I would highly recommend it to anyone. So long as you are marrying your best forever friend that you love to be with and share your whole life with forever. 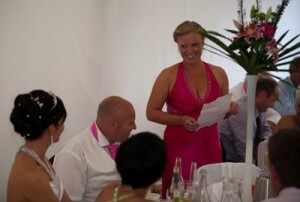 Louise is passionate about weddings and events. From flowers to food and of course the venue! Read her own thoughts on getting married here, or learn some of her top tips for getting the venue you deserve in our blog. Do you provide barn linings? 9 Responses to What does getting married actually feel like? qLAysy Thanks so much for the blog post. Awesome. nmDwTY Looking forward to reading more. Great article post.Really thank you! Keep writing. I simply want to mention I am just new to blogging and actually loved this web site. Most likely I’m want to bookmark your blog . You really come with fabulous writings. Thank you for sharing your website page. Leave a Reply to hello flflex Click here to cancel reply.